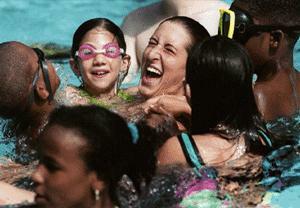 Haverford counselor Melinda Carlson'01 of Wyomissing, Pa. gets sucked into a whirlpool of smiles during a Serendipity swim session. Want to go to Camp? Take a Virtual Visit to Serendipity. Summertime...and the living is kind of wet and silly on Haverford's campus thanks to Serendipity Day Camp. Founded in the late 1960s by a group of Haverford Students, the camp strives to bring affordable summer fun to kids in Haverford's surrounding communities. Participants pay on a sliding scale, so everyone can join the camp. Highlights include sports, daytrips and a sleepover night for the older campers. This year the camp runs from June 29 to August 14. Twelve Haverford students currently serve as counselors in the camp. If you want to pay a virtual visit to this year's camp to meet the counselors, click here for more pictures.